What ever happened to Yahoo The 9? The 9 was a daily video compilation, or vlog, on Yahoo! featuring the nine top “web finds” of the day. It was launched on Yahoo!’s homepage (and Yahoo! TV) on July 10, 2006. The show, hosted by Maria Sansone, followed a similar format to pop culture list shows on cable TV. What set The 9 apart was, although it had a candy-coated exterior with a pretty, bubbly girl hosting it, underneath it all it was a show for web geeks. The nameless, faceless Yahoo staff members scoured the internet, looking for sites with new, innovative ideas. They also let you in on what they thought was funny online. Often this would be a goofy flavor-of-the-month Youtube video. To keep things light the host threw in the occasional football reference in an attempted to keep general audiences appeased. Another interesting inclusion was the Pepsi Tenth – a feature where viewers could submit websites that the producers of The 9 missed. The next day, one (sometimes more) of the nine websites was a “Pepsi Tenth” site. I hadn’t heard about The 9 until July 27, 2006. A massive surge of traffic was coming from a Yahoo page. When I checked it out I was of course thrilled. There Maria was, touting the site I had worked so hard to promote. Although, I had done a lot to get the word out that month, I was still surprised that the producers of The 9 even found my modest site, TypoHound. It turned out that they likely found about it on i-am-bored.com. The staff at Yahoo frequented this site looking for ideas. 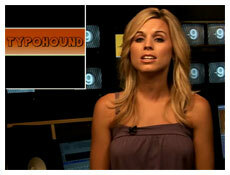 When I submitted TypoHound to i-am-bored.com, I didn’t expect much. It ended up receiving tons of hits and comments, many positive, many negative and the site became a hot topic. Sure, that is fine. What baffles me is why they put all that work into the show and then removed all the content and videos when it was cancelled. Would it hurt Yahoo to provide an archive? Bring back this page, Yahoo. I’d like to see Maria talk about searching for David Hasselhoff items with TypoHound one more time. Posted in TypoHound and tagged vlog, yahoo on May 24, 2009 by admin.